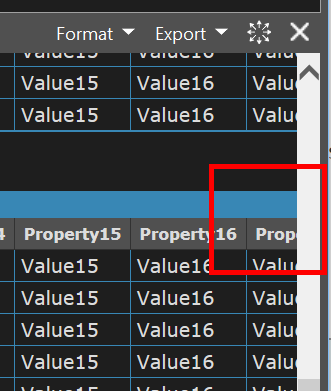 When a Dump list is wider than the screen, LINQPad conveniently adds a hover arrow for the "view in grid" option in the upper right of the results so the user does not have to scroll horizontally to invoke "view in grid". 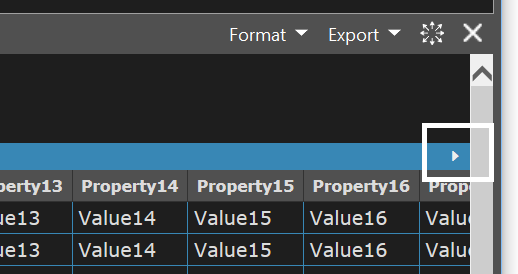 However, if a later grid result from the same query is below the first screen scroll of Results, the hover arrow is not shown on the later grid, so the only way to invoke "view in grid" is to scroll all the way to the right and find the static arrow. Set screen small enough or i and j max values large enough such that Dump grid is larger than the Result window, both vertically and horizontally. First grid will have the hover arrow, second grid will not. I guess I'm trying to do something that's not possible with CSS. However, if you scroll horizontally, it will no longer position correctly.